Crystal Palace memorabilia is difficult to find if you are a collector. Occasionally the very persistent collector will find a medal in bronze, like the ones at the Copper Corner, but they are hard to come by. If you have an interest in Crystal Palace history, this article will be of interest to you. Originally built in London in 1851, this iron and glass building was created for the Great Exhibition and its 14,000 exhibitors. The building was 900,000 square feet and was beautifully designed with fountains, gardens and terraces. Exhibits included the first ever dinosaur exhibit as well as every new technology of the time. After six months the Great Exhibition had ended and the building had to be moved from Hyde Park. Its new home became Penge Place where it stood in all its grandeur until 1936 when, sadly, the Crystal Palace burned to the ground. All that remained were the two water towers that were eventually dismantled during World War II. In 1979 the Crystal Palace Foundation was established to make sure that the original Crystal Palace is forever a part of British history. Today their volunteers staff the Crystal Palace Museum which was founded in 1990. It is open only on Sundays and bank holiday Mondays from 2:00 to 5:00. Quite the contrast from the actual Crystal Palace which was closed on Sundays even though most would be visitors could only get there on Sunday. It is thought that this contributed in part to the financial problems that the Crystal Palace experienced. Visitors of the museum will also enjoy the Crystal Palace Park in South London. Of the many attractions in the park, one that may interest you is a display of 33 prehistoric "creatures" that were originally built in 1854, guided by the originator of the word "dinosaur, Professor Richard Owen. These models differ from what scientists today surmise dinosaurs to look like, but were accepted based on the knowledge of that time as scientifically accurate. There are many other attractions that you will enjoy as well when you visit the Crystal Palace Park. 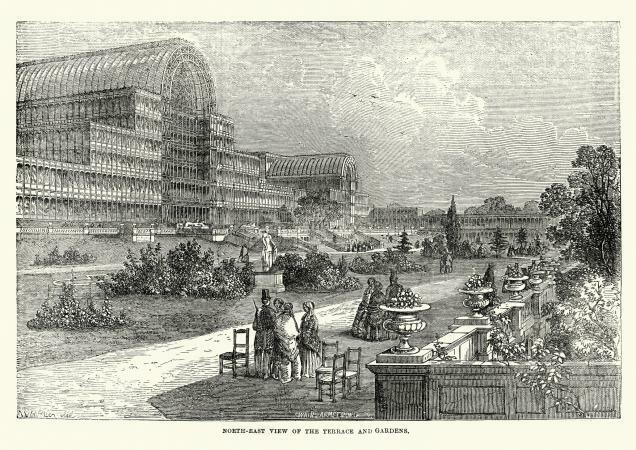 A popular addition to many films and books, the Crystal Palace has also been the inspiration of modern day structures. For example, Walt Disney World Resort has a restaurant named The Crystal Palace in honor of the British original. In Dallas, Texas an exact replica of the original Crystal Palace was erected in 1985. This structure, known as the Infomart, brought in $97 million in revenues its first year and like the original, it too shows the newest technology of its day. It also was honored by the British as being the successor to their own Crystal Palace from days gone by..
Of course, let's not forget the Crystal Palace Football Club of England, founded in 1905 for those who enjoy sports memorabilia. Collectors of Crystal Palace memorabilia no doubt cherish the history of the original British structure as well as its modern-day inspirations. One thing is for certain, the Crystal Palace will forever inspire the hearts and minds of historians and lovers of architecture for centuries to come. The Crystal Palace (My Story) by Francis Mary Hendry. Guide to the Crystal Palace and Its Park and Gardens by Samuel Philips.